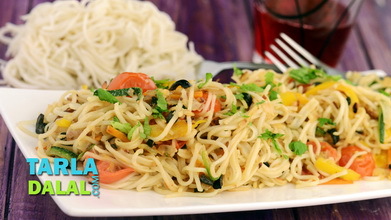 This one-dish meal is sure to strike every single of your taste buds with its vibrant flavour! 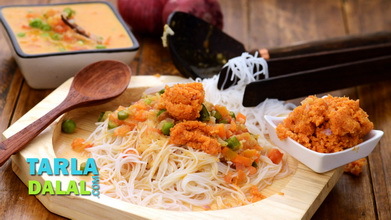 The Burmese Khowsuey features layers of noodles, a vegetable curry made with coconut milk and an elaborate masala of spices, coconut and cashew nuts, and an elaborate garnish of fried onions, garlic, vaal dal and spring onions. 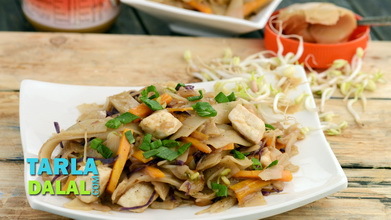 This gives the dish a unique texture and a really unforgettable flavour. 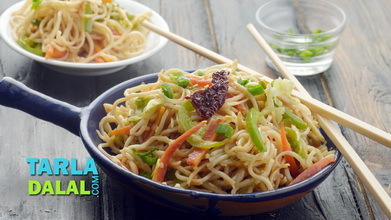 Although this dish obviously involves too much effort, right from preparing the noodles and the curry to the garnishes, it is completely, absolutely worth it! Heat the oil in a deep non-stick pan, add the bayleaves, curry leaves and onions and sauté on a medium flame for 2 minutes or till it turns light brown in colour. Add the prepared paste and sauté on a medium flame for 1 minute. Add the tomatoes and sauté on a medium flame for 2 more minutes. 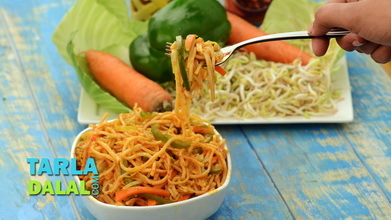 Add the mixed vegetables, coconut milk and salt, mix well and cook on a medium flame for 4 minutes, while stirring occasionally. Keep aside. 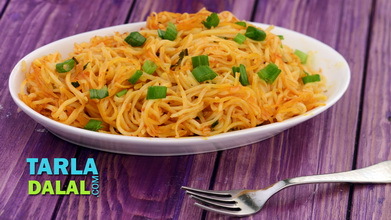 Heat the oil in a deep non-stick pan on a medium flame, lower the flame, add the garlic and deep-fry on a slow flame till they turn brown in colour. Drain on an absorbent paper and keep aside. 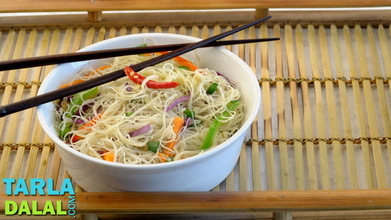 In the same hot oil, add the onions and deep-fry on a slow flame till they turn brown in colour. Drain on an absorbent paper and keep aside. In the same hot oil, add the vaal dal and deep-fry on a slow flame till they turn brown in colour. Drain on an absorbent paper and keep aside. Divide the curry into 4 equal portions. Keep aside. 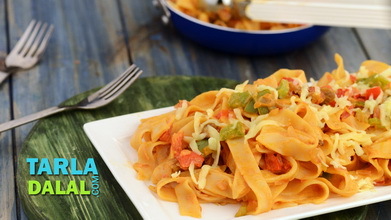 Take 1 cup of rice noodles in a serving bowl, top it with one portion of the prepared curry evenly over it. 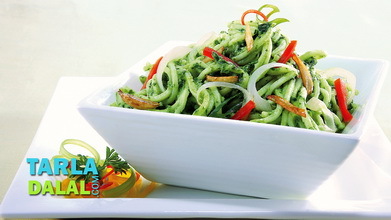 Garnish it with little fried onions, fried vaal dal, fried garlic, and spring onions evenly over it. Finally sprinkle coriander, chilli flakes, little salt and lemon juice. Repeat steps 2 to 4 to make 3 more servings.